A shoutout to our castmate Mikey who recently got to design a Magic card and was announced as the keynote speaker for PAX Prime 2014! But most importantly he just dropped a video review of the 1990 Teenage Mutant Ninja Turtles. Please enjoy. 15 Responses to Congrats Mikey! How on earth did he get the opportunity? If the article says somewhere I apologize, I cannot look at it as I am at work. Well, it probably won't fade away without a trace thanks to YouTube. It did feel a bit heavier on "and then X happens" plot summary and a bit lighter on riffing than I expected. I'd need to see one for a movie I haven't seen to tell whether that's actually a problem or a necessity though. But at the same time I'm not sure if I'd want to watch one for a something that's worth watching where the entire plotline is given away by the video if I haven't already seen it? Hm. The only other thing I'd suggest is the same thing you've done with the podcast and taking a lesson from Master Splinter to end on a higher energy "Ah-haha! I made a funny!" moment. As someone who hasn't seen the movie, the format worked fine. Not sure I'd want to see all riffing, all the time on everything anyway. Jeez, everybody hates Danny, huh? SQUID HORROR. Best creature type. wow that's a lot of awesome stuff happening all at once. Is that the new tactic? Wait a while and then just mob the people with a bunch of stuff? Well it's working. Congrats Mikey. I was completely unconcerned with the mix of summary and commentary; this was all stuff that I found interesting to hear. Magic I can't speak to, but the PAX Prime keynote? Massively stoked. 😀 Mad props, big ups, the whole shebang. Becky called it: for some reason that "Hey, Sam Rockwell brought cigarettes!" riff just stuck with me, prompting random giggles ever since. 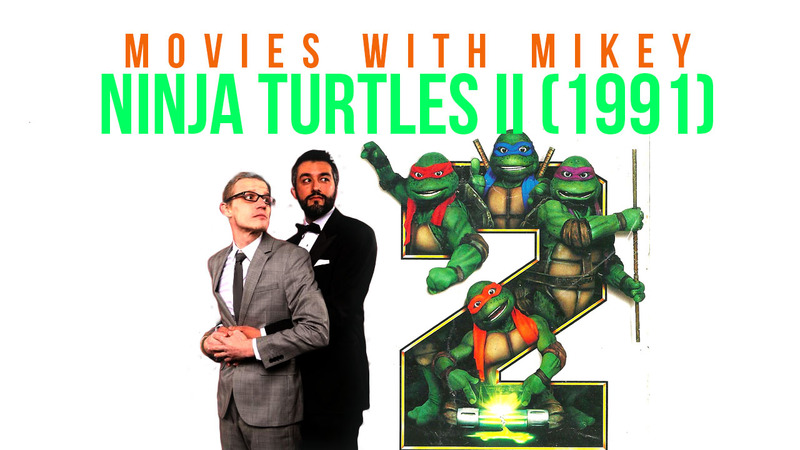 The whole review is *very* Mikey: background, great observations, dialogue discussion, editing dissection. Can't wait to see what else is down the pipeline. I didn't really have anything else to add. Good vid biz. The original TMNT is easily one of my favorite films, even though the like three or four times Raphael says damn meant my parents didn't let me see the movie for years (I had a Cool Uncle who let me watch it though, as well as Predator and Commando. COOLEST UNCLE). You changed the thumbnail. AH. Amazing. Love it. I decided that Kris and I lovingly embracing would be in every thumbnail. GASP! The Secret of the Ooze! That one's EVEN BETTER! Ohhhh, I do bad things to this movie … I used to really like it as as kid, but yikes does it not hold up anymore. is it the line, "Nummers"? When they're feeding donuts to the snapping turtle or whatever?